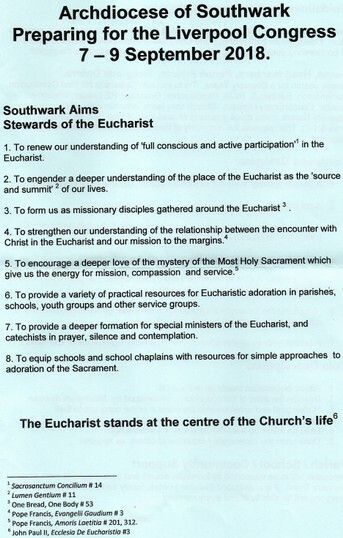 At a recent meeting of the delegates from Southwark diocese, Fr John Mulligan gave us our “commission” to bring back information and inspiration from the gathering. Then at the Deanery Mass on 5th July, we received the blessing of the deanery clergy, and all of the congregation, to send us on our way! We have one official parish delegate, but we are fortunate to have three other people, also resident in the parish, who will be attending in different capacities. Following the congress, the delegates are to get together to “collect the verbal wisdom” of the group, to see how we can use the experience gained to enrich our celebration of the liturgy in our Parish. We will also be submitting a report to the Diocesan Listening Team. A preliminary report will be ready for November, when emerging Congress themes will be considered. This report will be used in forming the life of faith, at a national level, as well as in the diocese, deaneries and parishes. Brendan Cleary will talk on this subject in two locations on Saturday 3rd February 2018. 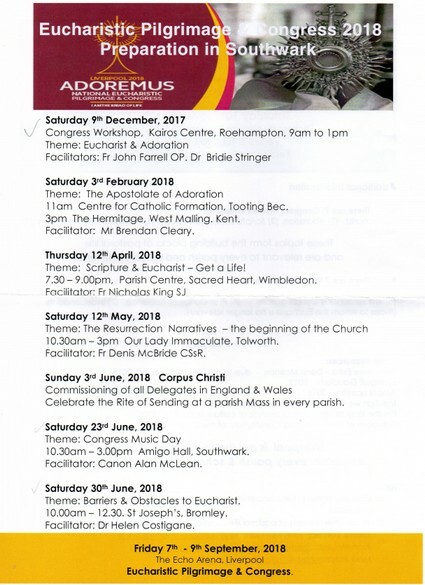 Rebekah O'Keeffe will lead an art workshop focussing on Adoremus on Thursday 8 February at 6.30 pm at the Centre for Catholic Formation. There are two meetings planned specifically for delegates to prepare for the Congress. Please try and come to ONE of them. Belmont Grove, Lewisham, London SE13 5GE. Our Lady of Reparation, West Croydon. 70 Wellesley Road, Croydon, CRO 2AR . 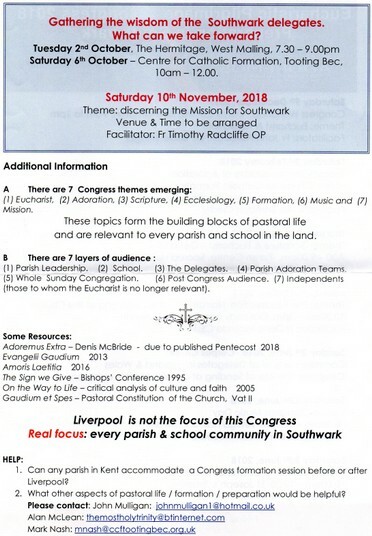 Please also invite your priest or deacon to come with you to the preparation session – even if they are not travelling to Liverpool. The Congress concerns us all. 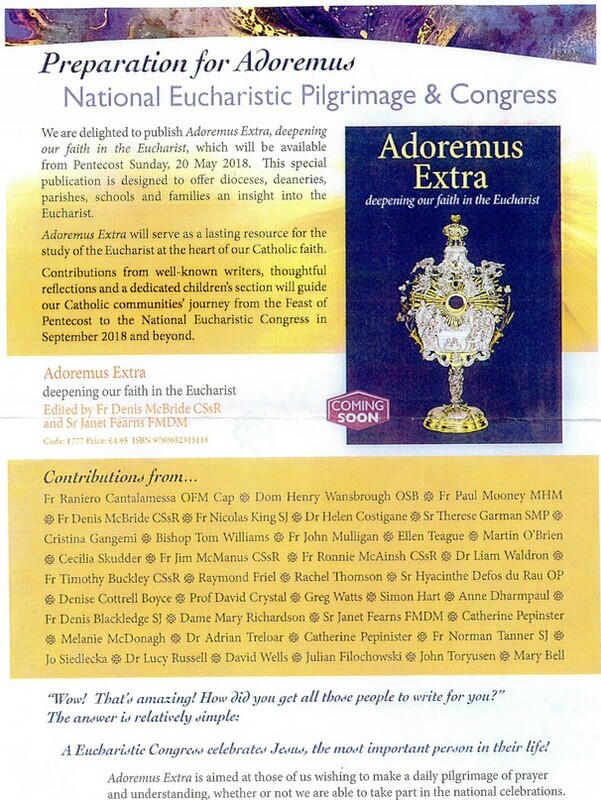 Please let Coral Davis at the Centre for Catholic Formation know which venue you plan to attend. We need to know numbers for the host venues. truly present in the Eucharist. those who have walked away from you and those who are eager to know your love.